Julie Ann Giroux was born in Fairhaven, Massachusetts on December 12, 1961. She graduated from Louisiana State University, Baton Rouge LA in 1984. Her first published work for concert band, published by Southern Music Company was composed at the age of 13. Julie began composing commercially in 1984. She was hired by Oscar winning composer Bill Conti as an orchestrator, her first project with Conti being “North & South” the mini-series. With over 100 film, television and video game credits, Giroux collaborated with dozens of film composers, producers, and celebrities including Samuel Goldwyn, Martin Scorsese, Clint Eastwood, Madonna, Liza Minnelli, Celene Dion, Paula Abdul, Michael Jackson, Paul Newman, Harry Connick Jr. and many others. Projects she has worked on have been nominated for Oscars, Emmys, Grammys and Golden Globe awards. She has won individual Emmy Awards in the field of “Outstanding Individual Achievement in Music Direction”. When She won her first Emmy Award, she was the first woman and the youngest person to ever win that award. Giroux has also published a large category of classical works with emphasis on original compositions for Wind Band which are published by Musica Propria and distributed internationally. She is greatly sought after as a composer and recently completing her 5th Symphony “Sun, Rain & Wind” which premiers in June, 2018. Her music has been recorded and reviewed internationally receiving rave reviews and has been performed at major music festivals the world over. Giroux has been a true force in a male dominated field and has accrued many previously male only awards. She is a member of ASCAP, The Film Musicians Fund, Kappa Kappa PSI, Tau Beta Sigma and a member of the American Bandmasters Association. 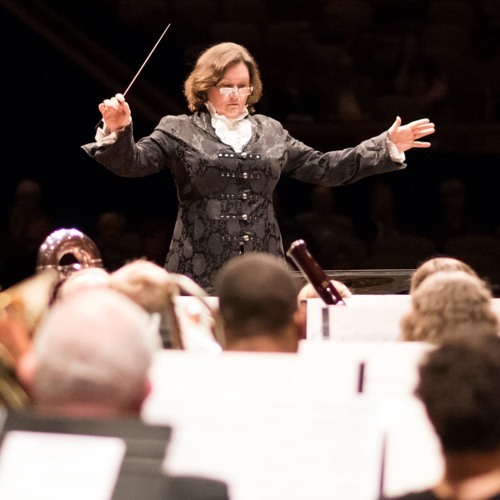 She is a recipient of the Distinguished Service to Music Medal Award, The Emmy Awards and was the first female composer inducted into the American Bandmasters Association in 2009.